Worrying about words may well seem like a frivolous luxury at this stage in the history of the Republic. We have, after all, recently witnessed the end of the most divisive election season in recent memory, waged between two of the most polarizing candidates in the history of the presidency. 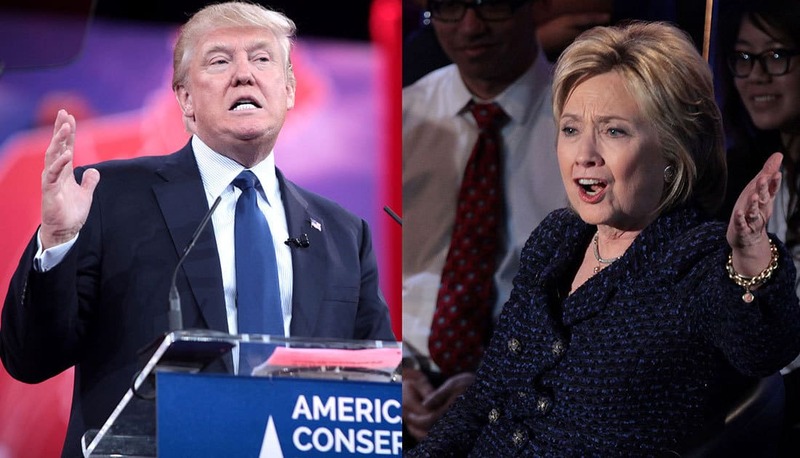 Election-night coverage and voting patterns revealed a battle between two sharply divided, mutually suspicious Americas, and however relieved one might be about the results of the election, precisely how the conflict will resolve itself is still far from clear. In the meantime, the future of religious liberty, the right to life, and America’s place on the world stage all hang in the balance. Given this state of affairs, wrangling about language seems an irrelevant distraction, or even positively counterproductive—the rough equivalent of insisting on Queensbury rules in a street fight or applying makeup to a triage patient. If such a concern is a luxury, however, it did not seem so to the great British writers of the first half of the twentieth century. 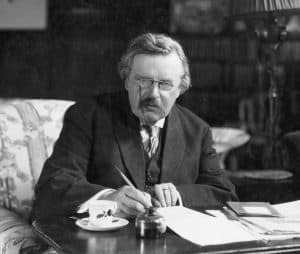 On the contrary, faced with a similar civilizational crisis, men like G. K. Chesterton, T. S. Eliot, and C. S. Lewis worried about words a great deal. Indeed, the concern for the degradation of the English language—and the simultaneous degradation of English social order—is a recurring theme, running through and uniting many of their writings. Where Chesterton led, others soon followed. Evelyn Waugh reacted against the drab tyranny of Basic English; the result was (in part) the elegant style of Brideshead Revisited. J. R. R. Tolkien adopted a similar style in his Lord of the Rings, casting his magnum opus in deliberately archaic prose. His reasoning was simple. As he explains in his Letters, modern speech is incapable of adequately expressing the heroic thought of days gone by; chivalric speech and chivalric thought go together. The reverse is also true. The language of Tolkien’s orcs is nasty, brutish, and abusive; the language of Saruman is manipulative and deceptive—what he calls “fair distribution” is nothing other than theft. The purification of speech is the purification of thought; without it, any real reflection—aftersight or foresight—is impossible. The theory of Orwell’s “Politics” is mirrored almost exactly in his dystopian novel 1984, in which Ingsoc, the English socialist dictatorship, holds absolute control over every aspect of life, including speech. One of Big Brother’s most important means for maintaining its control is the debasement of the English language through the creation of “Newspeak”—effected through the elimination of some dangerous words, the weakening of others, and the creation of a flat, inflexible vocabulary. The reason for this linguistic mutilation is complicated but critically important. When a word loses its meaning or vanishes altogether, the concept it represents vanishes too. 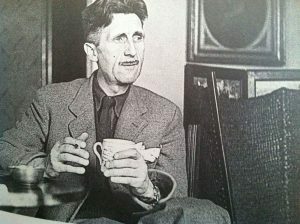 With sufficient linguistic debasement, as Orwell explains, “a heretical thought—that is, a thought diverging from the principles of Ingsoc—should be literally unthinkable.” So, for instance, the word free was redefined in Newspeak to mean merely lacking an undesirable trait, as in “This field is free from weeds.” The older meaning—political or economic freedom—is gone, and as a result, the statement I am a free man is meaningless. Meaningless, and therefore incapable of threatening the totalitarian dictatorship. Turning from theory to practice, it is not difficult to see Orwell’s principles played out on the national stage today. Words like freedom, choice, and love—and, in some uses, even man and woman—have lost their meaning or collapsed under the weight of many conflicting meanings; Newspeak is alive and well. Orwell’s fictional Ministry of Love was founded on self-contradictory slogans: “WAR IS PEACE. FREEDOM IS SLAVERY. IGNORANCE IS STRENGTH.” The modern university is not far behind: in most cases a commitment to diversity demands increasing ideological conformity; tolerance seems to imply instead a rigidly narrow intolerance. The corruption has extended even to words lacking any obvious political meaning. Antiquated, as used in contemporary political discourse, seems to mean something like “originating in or characteristic of a year before 2011, and therefore outdated and reprehensible.” The term has become a precise real-world equivalent to the Orwellian oldthink. With the question of abortion, we return to the main point of this essay: the 2016 presidential campaign. Mrs. Clinton is a typical politician if ever there was one, and her campaign traded extensively in Orwellian rhetoric—indeed, the three euphemisms for abortion in the last paragraph were drawn from one of her statements on the subject. She is not, of course, the only politician to use such language: it has been the dominant argot of the established parties of the last century or so. Despite the social and political success of the parties of “long words,” however, their victory has been less than complete. The reason is simple. As Chesterton’s Michael Moon noted, the condescension of the cognoscenti is a form of bullying, and people resent bullying. Up to this point, Mr. Trump seems like a hero for honest, direct speech, and in many ways, he has been. But the battle to “purify the dialect of the tribe” does not end with Mr. Trump’s inauguration. Indeed, the 2016 election raises new concerns. In the first place, it is only fair to note that Mr. Trump’s campaign relied heavily on the vague, emotive slogans and phrases that Orwell deplored so intensely. The call to “make America great again” could mean any number of things; so too could Mr. Trump’s victory-speech promise to “bind the wounds of division” afflicting the nation. It is not that either phrase is inept or inelegant: the first channels the spirit (and, indeed, the slogan) of Reagan’s 1980 presidential campaign, while the second employs the language of the Psalter and the parable of the Good Samaritan. But it is difficult to say just what either phrase actually means or what concrete actions they would entail. More serious problems emerge when we turn to some of Mr. Trump’s remarks on terrorism. As noted above, Chesterton, Orwell, and company assumed that certain claims were so reprehensible as to be unspeakable, and that men invented long words to conceal their true purposes from their followers and even themselves. But when discussing America’s struggle against terrorists in the Middle East, Mr. Trump openly suggested that the United States government should engage in war crimes: it should be willing “to take out their families.” This is certainly a more honest and literal statement than the Obama administration’s promise to “degrade” ISIS—but if it is not just another “truthful hyperbole,” it is horrifying: a bald-faced assertion of the indefensible, with no attempt at defense or justification. More alarming still, while Mr. Trump’s detractors were quick to pounce on his words, many of his supporters gave the remark a pass, accepting either that their candidate exaggerates outrageously, or that it is acceptable to murder children to punish their parents. The old rhetorical demons have been chased out, and for this we should be thankful—but what will take their place? Despite all this, there are many reasons for hope. Confucius believed that the first step toward justice is the rectification of names—that is, calling things by their proper names and ensuring that they fulfill their proper roles. At the dawn of 2017, we have an unprecedented chance to do just that. The candidacy of Mr. Trump was fueled by his rebellion against modern political rhetoric; his election to the presidency vindicated the critique. But it is one thing to destroy a corrupt system—it is quite another to build up a new one in its place. This is especially true in the realm of speech. Language is fluid, and nature abhors a vacuum. Yes, the old patterns of speech and old rhetorical rules have been cleared out, for now. But unless something else takes their place, it is only a matter of time before they come rushing back in. Providing that something else will be one of the defining challenges for us during the Trump presidency. We must speak honestly about the Good, the True, and the Beautiful. Doing so will require private and public virtue: honest self-examination to ensure that we speak truly, and the courage to criticize our own allies, parties, and patrons when they do not. The field has been cleared of weeds. It is our job now to keep it clean, plant good crop, and—by the grace of God—bring the harvest in. 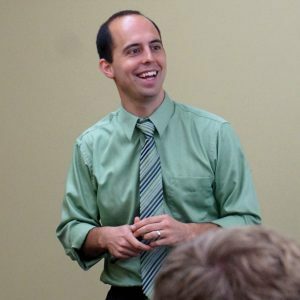 Ben J. Reinhard, Ph.D., is assistant professor of English language and literature at Christendom College. A scholar of medieval English literature, he earned his B.A. from Purdue University and his doctorate from the University of Notre Dame, where his dissertation explored works in Old English by the medieval Anglo-Saxon bishop Wulfstan of York. Reinhard’s publications can be found in scholarly journals such as the Old English Newsletter, English Studies, and Religion and Literature (forthcoming), and he has also delivered numerous scholarly conference papers and public lectures on a variety of literary topics. He and his family live in Front Royal, Va.
See Donald J. Trump and Tony Schwartz, Trump: The Art of the Deal (New York: Random House, 1987), 56–58. Newt Gingrich—one of Mr. Trump’s close advisers—has suggested that Mr. Trump’s insistence that Mexico pay for the wall was intended as “a great campaign device” not to be taken literally. Given the “softer” and more nuanced immigration statements offered by the Trump campaign since August, it seems likely that Mr. Gingrich is correct.